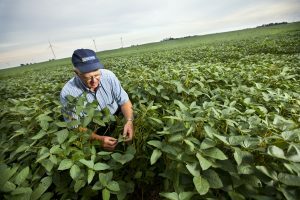 The Iowa legislature saw so much value in this field trial program that it provided funding to reimburse farmers who lost yield in their efforts to improve efficiency. With no risk involved, Denny was able to see “how low he could go” with fertilizer applications before he had an economic loss in production. I first met Denny when Environmental Defense Fund connected with the Iowa Soybean Association’s program, which served as a model for the development of EDF’s own farmer networks and the Farmer Network Design Manual. 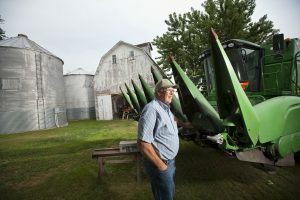 I’ve never ceased to be impressed by Denny, who is a director at the Iowa Corn Growers Association and grows corn and soybeans on a beautiful operation near Radcliff, Iowa. Denny is also a big believer in ag retailers as the key to bringing ag sustainability to scale. His local co-op, Innovative Ag Services, was one of the first to sign-on to Land O’Lakes’ SUSTAIN® platform, which trains ag retailers in best practices for fertilizer efficiency and soil health. I asked Denny about his passion for conservation, what the Land O’Lakes’ SUSTAIN® platform has meant for his operation, and how the Des Moines Water Works lawsuit is affecting area farmers. How did you first get involved in farming? I grew up raising pigs on my family farm, and always knew that I was meant for a lifetime in agriculture. I still farm today with my middle son, and my oldest son is an ag engineer. I’m proud that I’ve interested the next generation in agriculture, especially as I transition the farm to my son when I retire. What’s your take on sustainability? Sustainability has always been near and dear to my heart. Yes, farmers aim for as much profit per acre as possible, but sustainability works hand in hand with being a low-cost, efficient producer. Nutrient management is incredibly important to my operation. We use hog manure as a nutrient, and my goal has always been to try and get as much use as possible out of this resource, over as many acres as possible. But no-till farming is not as practical here in Iowa – my biggest issue is nitrogen utilization. We’re not all in the same situation, and we need to consider the practices that are best for our farms. I’ve also invested in technologies such as GPS and OptRx Crop Sensors to measure the amount of N that a plant needs. I’ve been able to justify the expense of these technologies by reducing my input costs. These resources are not just bells and whistles – they’re helping me better manage my nutrients. How did you first learn about Land O’Lakes’ SUSTAIN® platform? My local coop, Innovative Ag Services, hosted a Land O’Lakes’ SUSTAIN® platform grower meeting that really resonated with farmers in this area. Changing the rate and timing of my fertilizer applications is the low-hanging fruit around here, and in talking to my local agronomists, farmers really are looking to do a better job. There are also common sense economics involved in being more efficient. There is a lot of interest in the Land O’Lakes’ SUSTAIN® platform from the retail side, too. My local supplier said they’re doing research trials on one of the tools in the Land O’Lakes’ SUSTAIN® platform toolbox. They’ve invested in the tools that enable me to have better information for making decisions, and in the equipment to be more precise with my inputs. These innovations include a Soil Scan®, Y-Drop® application, and a granular buggy that can apply urea when the corn is waist high. What have you learned from participation in on-farm networks? We always thought that yield was key – but it’s really about profit per acre. Yield is important – but I don’t want to over apply my nutrients. I want to utilize all of the nutrients that I’m putting out there on the farm. We have a changing philosophy in the farming community, as we’re now looking at environmental concerns – it’s a significant mindset change in production agriculture. Farmers are part of the nutrient runoff problem, but they also need to be part of the solution. What are you hearing about the Des Moines Water Works lawsuit? It’s a huge topic of discussion with Iowa corn growers. The bottom line is that we are doing a lot of positive things, and our waters are better than they were 20 years ago – but there’s a lot of room to improve. Yet, forcing farmers to do something doesn’t always work. Instead, we need to get farmers educated – and the Land O’Lakes’ SUSTAIN® platform is a great way to do that. I also want to remind everyone that we’re constantly dealing with Mother Nature – not just nutrients. Some things are beyond our control but we need to do a better job on the things we can control. This entry was posted in fertilizer, Sustainable Agriculture and tagged ag retailers, corn, Des Moines Water Works, fertilizer efficiency, fertilizer management, fertilizer optimization, fertilizer runoff, iowa, Iowa Corn Growers Association, Iowa Soybean Association, Land O'Lakes, nitrogen, nitrogen surplus, nutrient management, nutrient use, soil health, soy, SUSTAIN, water quality. Bookmark the permalink. Both comments and trackbacks are currently closed.